The latest model to the Range Rover fleet brings glamour, modernity and elegance to the iconic British family offering a unique combination of design excellence and engineering integrity. The extraordinary design of the Range Rover Velar showcases perfectly optimised proportions and an exquisite silhouette. Its super-slim Matrix Laser-LED headlights, flush deployable door handles and sleek Touch Pro Duo infotainment are all trademarks of Range Rover’s reductionist design philosophy. 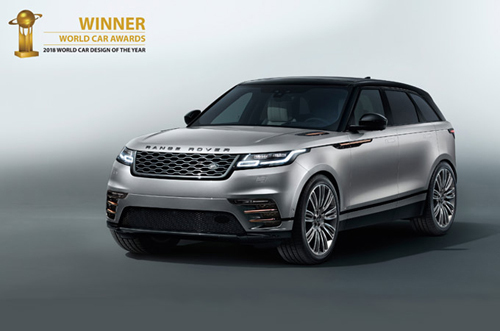 The luxury SUV from Range Rover surpassed the Volvo XC60 and the Lexus LC 500 to take the World Car Design of the Year award, as voted for by the World Car Awards jury, comprising 82 influential motoring journalists from 24 countries. The Velar’s success follows the 2017 double win for the Jaguar F-PACE. Launched last year and named after the codename for the original concept Range Rovers of the late 1960s, the Velar takes space between the Range Rover Evoque and Range Rover Sport. It is available with a choice of six powertrains, ranging from the clean and responsive 180HP 2.0‑litre Ingenium diesel to the potent 380HP supercharged 3.0‑litre V6 petrol engine. Designed, engineered and manufactured in the UK, the Velar delivers practicality, connectivity and capability as you would expect from Range Rover. With the latest technology and the inclusion of more sustainable materials, this luxury SUV is designed to go Above and Beyond. To rent the Range Rover Velar from Signature, call 0207 118 2244 today. Presenting the new DBS Superleggera from Aston Martin.